Consumers are finding “pieces of soft, blue rubber” in their nuggets. Tyson is recalling 36,000 pounds of chicken nuggets after customers complained of finding “pieces of soft, blue rubber” in them. Five-pound plastic bags of “Tyson White Meat Panko Chicken Nuggets” with a “Best if Used By” date of Nov. 26, 2019 “may be contaminated with extraneous materials, specifically rubber,” the U.S. Department of Agriculture’s Food Safety and Inspection Service announced yesterday. While there is no word yet on how the rubber got in the nuggets, the products likely originated from a slaughtering and processing plant in Missouri. 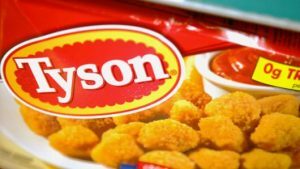 Last year, Tyson recalled 3,000 pounds of frozen breaded products last concerns they contained soft plastic. In 2016, the company recalled 132,000 pounds of chicken nuggets that may have been contaminated with hard plastic. That same year, it also recalled 16,000 pounds of its ground beef products over possible E. coli contaminations. Perdue Foods recently recalled 68,000 pounds of chicken nuggets that may have been contaminated with wood. Meanwhile, ground pork patties produced by Johnsonville, were recalled earlier this month for containing pieces of black rubber.